More environmentally friendly, to limit material losses and reduce energy consumption arising from the process of manufacturing the materials and products. Fives provides its competence, experience and capacity for innovation in terms of mechanical engineering, automation and industrial process control to support manufacturers in their development of these new technologies and the implementation of new materials. 2015 saw Fives’ entry into the field of additive manufacturing, a revolutionary manufacturing technique based on layering material which offers total flexibility and new advantages for the industry. Fives and Michelin join forces to create a future major player in 3D printing. 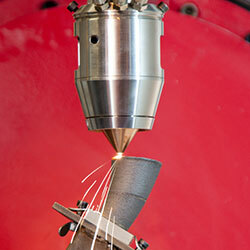 Fives provides 5-axis machines integrating CLAD® (Direct Laser Additive Construction) technologies. The transverse flux induction heating technology CELES EcoTransFlux™ is an innovation which allows the highly efficient rapid heating of steel strips to very high temperatures. As part of the stainless steel treatment process, CELES EcoTransFlux™ removes the strip chemical treatment stage during lamination and therefore reduces emissions and acid waste, providing improved metallurgical properties. Fives supports manufacturers to increase the productivity of their composite parts production system by including online control and other operations such as drilling and assembly. Composite materials, which benefit from being lightweight and mechanically resistant, are widely used by the aerospace industry, but also by other business sectors such as renewable energies and biomedical; there are still significant development opportunities ahead for the use of these materials. 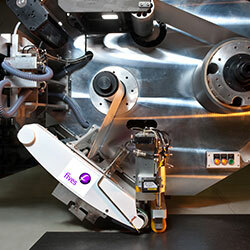 With the Cincinnati, Forest-Liné and Liné Machines brands, Fives offers fiber placement systems, carbon tape laying and placement systems, equipment for finishing and trimming, as well as controls and software for the manufacture of composite parts. In September 2015, Fives consolidated its aerospace offering with the acquisition of Lund Engineering (USA), specialized in the development of innovative solutions for the automatic manufacturing of composite parts in partnership with major clients in aviation and aerospace.